It started on a small farm in rural San Diego, where Mamma Chia founder and CEO, Janie Hoffman, in her quest to find an ideal diet for her own health, fell in love with the magic of chia. Janie quickly discovered this amazing little seed was providing a powerful vitality boost and was instrumental in addressing some challenging health issues related to longstanding autoimmune disorders. mamma chia ceo and founder, janie hoffman Janie believes that there are several components to a healthy and joy-filled life and no one thing holds all the answers, but there is no doubt that once she incorporated chia into her daily diet there was a very noticeable increase in her vitality, energy and strength. Janie became so enchanted with these little seeds that she was literally adding them to everything in her kitchen and giving away chia treats to everyone she knew or crossed paths with, but it was her chia beverages that became the biggest hit with her friends and family. In addition to finding the beverages to be fun and delicious, they also experienced a noticeable increase in vitality. In the summer of 2009, fueled by her passion for chia and her commitment to be of service to humanity and the planet, Janie founded Mamma Chia — the first organic, chia-based food and beverage company. In addition to her love of chia, Janie and her husband, Lance, enjoy growing Hass avocados and pineapple guavas on their small farm with their 2 kitties, Spanky and Sparky, and their sweet dogs, Yogi and Bodhi. I was really interested in this company simply because eating healthy and better is a new goal of mine and I love the nutrition that those little chai seeds have. Adding it to granola just seems so ingenious. 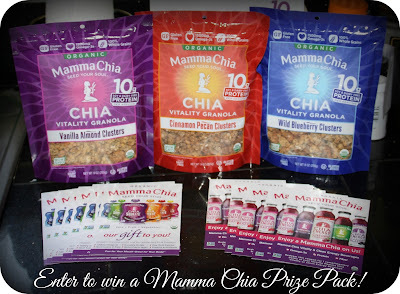 So, for this review I was sent a variety pack of Mamma Chia's New Organic Chia Granola Clusters, along with some vouchers for other Mamma Chia products. 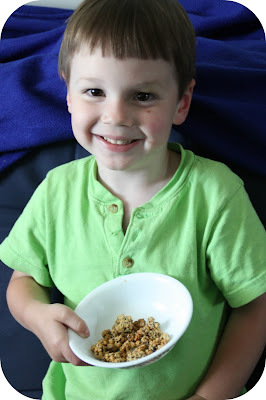 I will be focusing on the Granola Clusters in today's review. The flavors of Granola Clusters I received are Wild Blueberry, Vanilla Almond and Cinnamon Pecan. I was SO excited to try these!! These granola clusters are SOOOO yummy!! I had a small serving for an afternoon snack and it was filling, sweet and crunchy. It really satisfied my snack attack and I didn't feel like I needed to eat anything additional. My kids can be picky eaters and so when I offered some to my three year old, he cautiously accepted. Once he tasted the clusters though, he was begging for more. If my children love it then you KNOW it is good!! It made such an amazing snack for them, every time I open the bag, my children magically appear out of nowhere and ask for some. Haha! 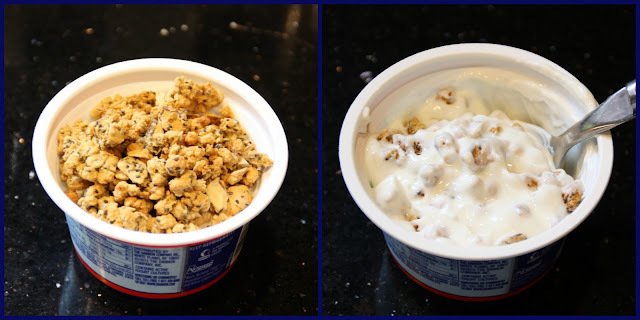 I have really been enjoying these Mamma Chia Granola Clusters in my morning yogurt. It doesn't matter what flavor of granola I eat, it blends really well with all of my yogurt flavors. I think my favorite flavor was the Wild Blueberry. Wow. Is it ever good!!! 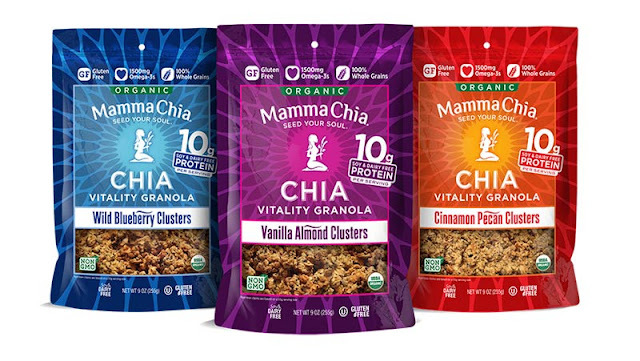 Mamma Chia says..."We lovingly blend our organic chia seeds with the highest quality gluten free, organic whole grains, fruits and nuts plus pack it with 10 grams of protein (soy free & dairy free!) to create tasty granola clusters to fuel your soul’s purpose!" You can find Mamma Chia's products at select retailers across the country. Simply visit their store locator page to find a store near you. The granola clusters retail for $6.49 per bag and, in my opinion, are worth every penny! I cannot wait to use my vouchers to try out the other Mamma Chia products. Who knows...maybe I will tell you about them once I taste them! Please be sure to also check out Mamma Chia on Facebook and on Twitter! Disclaimer: I received no monetary compensation for this post. 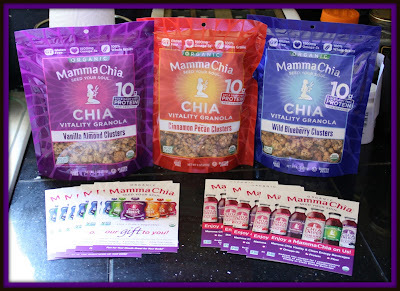 I did receive free Mamma Chia products for review purposes. All quotes and stock photos are from the Mamma Chia website and email. Prize is being provided and shipped by the sponsor. This blog is not responsible for lost, stolen or damaged prizes. All thoughts and opinions are 100% mine. I really want to try the Coconut Mango Vitality drink--it sounds so refreshing! I would love to try the Coconut Almond & Dark Chocolate Vitality Bars or any of the flavors. I would love the strawberry banana chia squeeze. I love mama chia drinks but they're very tricky to find in the area that I live. Their granola I often see advertised but never avaliable in stores around here. Would love love love to try those clusters, they look delicious! I would love to try the Chia Vitality Bar in blueberry and dark chocolate. That just sounds wonderful. I would like to try the strawberry banana chia squeeze. I would like to try the Cherry Charge Clean Energy beverage. I'd like to try Mamma Chia Raspberry Passion. I would love to try the Cherry Charge Organic Clean Energy Chia beverage. I like the Coconut Mango drink! The cherry lime drink sounds delicious! I'd love to try them all, but I'd try the blueberry granola first! 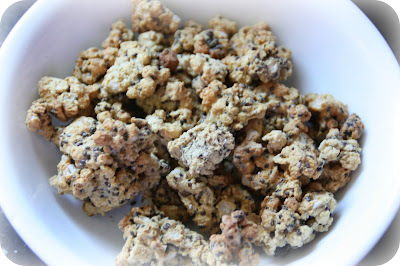 Mamma Chia - Chia Granola Clusters - Vanilla Almond Clusters - 9 oz. is one thing I'd love to try. Strawberry banana would be good. I'd like to try the Cherry Lime Mama Chia drink. I'd love to try the Blueberry Vitality bar! I would like to try the Mama Chia Raspberry Passion Vitality Drink. I,would like to try the Cherry and Dark Chocolate Mamma Chia Organic Chia Vitality Bars. I would first love to try the strawberry banana chia squeeze.